V/Line’s fourth train for Albury – has anything changed? For almost a decade V/Line’s service to Albury has been a complete and utter joke – marked by three years of full time bus replacements for track upgrades, followed by a revolving door of track and train faults pushing passengers onto buses yet again. The government has promised the public that they are doing something about it, by introducing a fourth train set, but has anything actually changed? Since the 1960s the railway from Melbourne to Albury consisted of two separate railways – the broad gauge track used by intrastate trains, and a parallel standard gauge track that carried interstate services into New South Wales. The problems date back to February 2008, when deteriorating track conditions saw a 80 km/h speed restriction placed on the broad gauge track between Seymour and Albury, forcing V/Line services to terminate at Wangaratta station in order to keep to the timetable. The ‘fix’ for the problem was the North-East Rail Revitalisation Project – the broad gauge track between Seymour and Albury would be converted to standard gauge and the existing track upgraded, resulting in a ‘brand new’ double track railway. Work started in 2008, with V/Line passengers being put onto buses for three years while work was completed. Just one problem – V/Line only had broad gauge trains! As a result three V/Line locomotives and 15 passenger carriages were converted to the standard gauge, to create a separate pool of trains to operate the services to Albury. This was enough trains to run three return services per day, with one locomotive and one set of carriages in the workshops under repair. 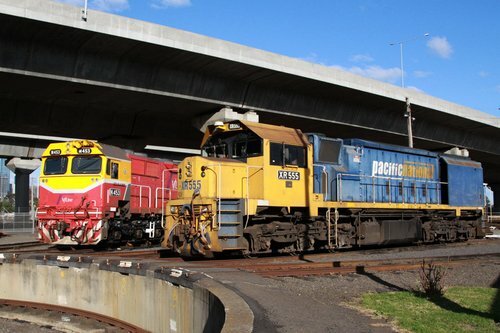 It was soon discovered that a single spare locomotives was not enough to maintain a reliable rail service – so in 2015 the State Government announced that a fourth locomotive would be moved across to the standard gauge fleet to improve reliability. The Andrews Labor Government is converting an extra V/Line locomotive to standard gauge to improve the reliability of train services on the Albury line. There are currently only three standard gauge locomotives available to haul trains on the Albury line. Routine maintenance means one of these locomotives is almost always off-line, leaving only two available to operate the six daily services. If a second locomotive has to be withdrawn from service due to a fault or damage from an animal strike, there is only one available, meaning services need to be replaced by coaches. Converting a fourth locomotive to standard gauge will give V/Line the buffer they need to provide more reliable services to Albury line passengers. The transfer of an additional locomotive from the broad gauge fleet has been made possible by the introduction of a new overnight maintenance regime, which means more trains are available for passenger services. 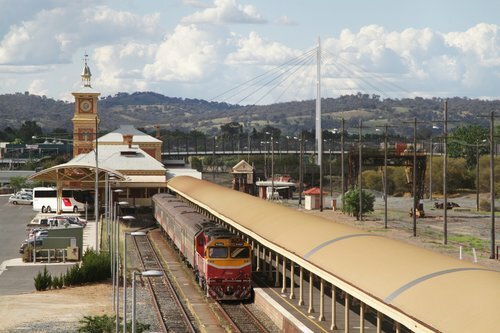 The improvement to Albury services comes as the Labor Government prepares to launch its Regional Network Development Plan – a long-term strategy to boost capacity, reliability and coverage of the regional public transport network. Communities in Northern Victoria will be consulted as part of the development of the plan, with consultation to kick off next month. The additional locomotive is expected to be ready for service on the Albury line by the end of July this year. Unfortunately for the people of North East Victoria, a spare locomotive wasn’t enough to improve their V/Line service, so in 2016 the government decided to shuffle the deck chairs – reconfiguring the existing fleet of three 5-carriage long trains into four 4-carriage long trains. The Andrews Labor Government is building a fourth train for the Albury line, to boost the reliability of services while it plans for the next generation of rolling stock for passengers in Victoria’s north east. Minister for Public Transport Jacinta Allan joined Member for Northern Victoria Jaclyn Symes at the Downer Rail workshop in Melbourne today, where V/Line has started reconfiguring existing carriages to create a fourth train. Currently, three five-carriage trains operate on the Albury line. This is the minimum required to run the three return services to Albury each day and means that if a train has to be pulled out of service, the only option is to put passengers on coaches. The extra train will mean there is one in reserve if anything unexpected happens – boosting reliability for passengers. On average there are around 330 seats per train and currently an average of 200 seats available on Albury-line services, so the reduction of carriages on each train will not affect the ability of passengers to get a seat. The reconfiguration work currently underway will take a carriage off each of the three existing trains and add a new one to create four four-carriage trains. V/Line has also already sourced and begun refurbishing a power van for the fourth train, which acts like a power supply generator for the fourth train, so it can have lighting, heating and cooling. The significant upgrade is part of $15 million provided by the Labor Government in the Victorian Budget 2016-17. The investment will also clean and repair the interior of the existing carriages, to make them more comfortable for passengers, and fund planning for the next generation of trains for the north east line. The reconfigured trains will start service in the first half of 2017. This fourth train entered service in April 2017, complete with flashy new PTV branding. But has anything really changed? Or is it just Malibu Stacy, with the same problems as before, but with a new hat? 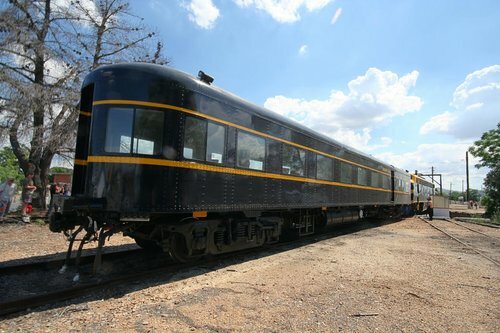 A few weeks after entering service, the brand new train was attacked by graffiti vandals. Reconditioned V/Line trains have been targeted in a graffiti attack. Services between Albury and Melbourne continued to run this week despite the carriages being vandalised with green, yellow, orange and black spray paint. 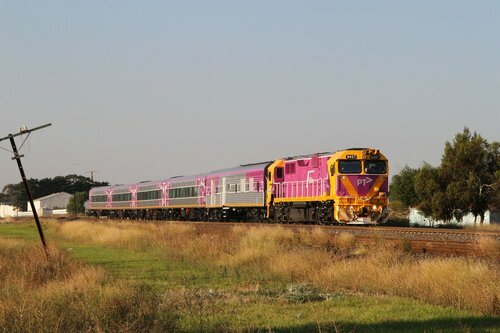 The 12.05pm Melbourne to Albury service was replaced by buses, and the 5.20pm Albury to Melbourne was also replaced by coaches on Friday, but a V/Line spokeswoman said that was not due to the graffiti. The carriages will be taken out of service to be washed next week. Wasn’t the point of creating a fourth train to allow for Albury services to keep running, even if another train is already in the workshops? Even with four locomotives V/Line still can’t provide a rail service to Albury. V/Line confirmed 30 train services have been replaced by buses since Boxing Day. “V/Line would like to apologise to Albury line passengers for the disruption to services over the past week,” a V/Line spokesperson said. “All four locomotives that run on the Albury line have experienced unforeseen faults. Two train services on Tuesday have already been cancelled and replaced by buses due to “maintenance requirements”. False economies at North Melbourne Station? You aren’t just going to leave a spare train sitting around doing nothing. Also, why standard gauge? Why not duplicate the tracks dual gauge? That’s the problem. 4 trains which can only serve one line, but clog up the interstate track. Good idea. Plenty of empty trains sit around on the rail network ‘just in case’ – in Melbourne in peak they have two trains (with drivers!) parked at North Melbourne and Camberwell ready to jump into action in case of a breakdown elsewhere. At least two standard gauge tracks make more sense than parallel broad and standard gauge, but it doesn’t negate the fact that an isolated pool of trains is a PITA. The first two are dual gauge because of a lack of space for dedicated tracks, the latter two was because a single dual gauge track was cheaper than two separate ones. Well written and said Marcus! Also questions to ask is the public funds that V/line used to purchase the ex Southern Aurora car NAM 2337 which was meant to be coverted into the power van for this “fourth” set which now sits on the ground at Newport Workshop project on hold indefinitely? NB: You don’t exactly pay someone to gutter the interior of a carriage, including removal of all windows if the sole intentions was to salvage the wheelset and undergear. The whole ‘sleeping car to power van’ conversion is a curious one – especially since non of the usual suspects have posted any photos of it. must be hiding away deep at Newport! I work at Newport and can tell you that that NAM car project has been canned. The engineers found the under frame needed extensive reinforcement to hold the weight of the two generators plus fuel tanks (cost too great). The NAM car is now stored in the weather, guttered, awaiting a move to a heritage group. They are now using ACZ 260 car ( involved in an accident at Werribee in the early 90’s and in storage at Newport since). I wonder how much of the ACZ carriage body will be retained? If a train breaks down in Albury, the’re not going to send the backup train all the way from Melbourne, are they? Passengers will still have to take the bus. They might as well have used the money to refurbish other locomotive hauled trains. The roofs on the broad gauge n sets are rusting and the seats are stained and dirty. Albury trains also have better air cons than other lines. What makes the Albury Line so special? True there on the backup train – by the time it reaches Albury from Melbourne it’d already be hours late! At best it would allow a failed train to not result in *multiple* services being replaced by buses. I believe the PTV paintjob was the same level of refurbishment as the rest of the locomotive hauled fleet gets every few years: the current grey and red livery dates back to 2007, so it is no surprise that rusted roofs and worn seats are startign to appear. Re reliability, the rule of thumb appears to be 5% of fleet active spare, and 10% in rostered maintenance. Because you can’t have half a train (the carriage functions are all different) the numbers need to be rounded up at every step, so the minimum fleet size for >70% fleet utilisation is 7 trains/sets. 10 sets gives 80%, 11 sets drops to 72% because of the rounding up, but after that it appears to fluctuate between 76% and 86%. A better solution for Albury might be to allocate the additional ordered VLocity sets 3VL67-75; eight distinct sets, which would allow one spare stabled at Seymour, two in maintenance and five in use, forming two 6-car consists and the remaining 3 cars available for a low-capacity run, or perhaps Horsham. Or alternatively, one spare at Albury and another at Melbourne, to be used if and when required. That way if one of the sets is damaged it can be replaced on short notice and the train can still run. Of course that would mean additional capacity would be required on the Geelong and Ballarat lines (apparently the 3VLs are already preallocated there), but returning the current Albury stock to broad gauge and re-mixing it with the remaining loco-hauled fleet provides a higher threshold and could fix that problem. The current loco-hauled long-distance fleet comprises 76 vehicles in three categories – broad gauge 4-car x4, standard gauge 4-car x7, broad gauge 5-car x6 and two vehicles spare unallocated. Using the above formula (which may or may not be accurate), that fleet can only sustain 46 of 76 cars in use at any time; any use of the remainder on regularly-scheduled services reduces overall fleet reliability. If all the sets were identical then you’d be looking at 2 sets maintenance, 1 spare and 14 in service, but that isn’t practical because different sets are allocated to each roster. So let’s say you organise the fleet into 19x interchangeable 4-car sets with 16 of those in regular use. Or if necessary, separate the 1960’s Z cars and 1980’s N cars, with the latter as 14x 4-car sets (11 in use), and the former on restricted runs to make up the capacity withdrawn from Geelong to provide Albury services. Either way you’re likely to end up with a better outcome than current. An better long-term solution to the “round up” fleet availability problem would be for a fleet of variable-guage trains to service the routes currently serviced by the N-sets – Albury, Bairnsdale, Warrnambool, Swan Hill and Shepparton. Spanish rail engineers have already solved the guage problem with bogies that are variable between their legacy narrow guage network and their high speed standard guage routes, and have about 600 variable guage carriages in service. We could pay the Spanish to build the bogies, and we make the rest of the train. (I believe the Vlocity bogies are made in India). While these bogies would be more expensive than standard bogies, they would save on investments such as dual-guaging the Upfield line. – on the Albury line they could use the shorter double track broad guage via Upfield as far as Seymour, then change to the double track standard guage to Albury. – the current Ararat morning service could start at Horsham on the standard guage, then switch to broad guage at Ararat. – the equivalent morning Maryborough service could travel on standard guage as far as Ballarat, which would allow a simple guage change of the line rather than the current plans to dual-guage the line. @Malcolm M – that’s actually not a bad idea. Say we applied that to our 25 N Class locos, 3x PCJ vans, 4x PH vans, 2x D vans, 20x Z cars and 56x N cars, I wonder what the cost would be? Some sort of fleet balancing would still be ideal, but perhaps not as critical. I’m not a fan of the use of the Upfield line for V/Line services; it has capacity but it really shouldn’t, because that represents wasted potential for electric services. That said, Wallan/Seymour/Shepparton services are likely to be diverted via Coburg for perhaps 5-10 years while the Southern Cross – Sunshine – Tullamarine – Wallan & clarkefield route is under construction, since the Essendon and Albion routes apparently won’t have capacity. I’m shocked by how fast the train is moving while the gauge conversion is completed – I’m guessing the only downside is the cost!